Sarah graduated from Charles Sturt University in 2012. She spent two and a half years in the Hunter Valley in mixed animal practice. In 2015, she travelled to Fiji to be involved in a volunteer desexing program. 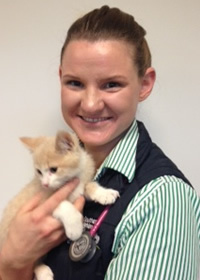 Sarah enjoys both small and large animal medicine and surgery. She grew up on a farm in Wagga Wagga and in her spare time enjoys riding her two horses, spending time with her two dogs Sunny and Padme, the cat Pumy and poddy calf Lila.